One of the great things about Hong Kong is that it keeps building and keeps changing. The bad thing is that the information here can go out of date a bit quickly if I am not careful. So with this, I give you the 2017 updated MTR map for Hong Kong trains and subways. They have added stations and added a whole new South Island Line, which is pretty important for visitors to the city. The South Island line is significant for visitors as it now gives you direct subway access to Ocean Park, one of the two major theme parks along with Disney Hong Kong. It use to be a bus ride from the MTR but now it’s got it’s own station on the South Island Line. Also, the green line has been extended to Whampoa, which makes it easier to get the shopping and the “big boat” attraction there. So this update has been good for everyone! Hong Kong is a city on the move, and any city on the move depends on it’s public transit. Hong Kong’s MTR corporation runs the trains and subways, which is generically referred to as “the MTR”. The system is a subway system (underground), a classic train (ground level) system, and also in some area an elevated system. The trains run to almost every area of Hong Kong, or at least get you close enough to your destination to take a taxi, bus, or even walk. The map isn’t to scale or anything, but it at least gives you an idea of the size of the system. You can see the Hong Kong Airport Express line that runs from Asia World Expo to Hong Kong station, colored blue-green. That is likely to be your first experience with the MTR system, and likely a very positive one. The ride from the airport to Hong Kong station takes about 23 minutes, this is the fastest train line, the orange line from Tung Chung to Hong Kong takes about 40 minutes to cover the same basic journey. The trip from Hung Hom to Lo Wu (the Chinese border crossing) takes about 45 to 50 minutes. 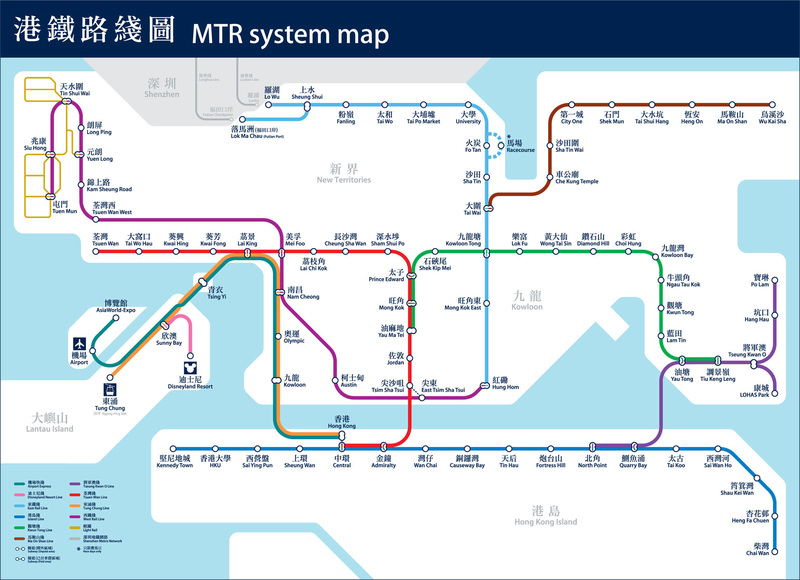 The full list of the lines include the Airport Express (blue-green), the Island Line (blue), the Tsuen Wan Line (red), The Kwun Tong line (green), The Tseung Kwn O line (Dark purple), the West Rail Line (Light Purple), the East Rail Line (light blue), the Man On Shan line (brown), The Tung Chung line (orange), and finally the Disney Land Resort Line (pink). The system is constantly in expansion and getting improvements, with the extension to Kennedy Town station recently added on the Island Line, and other extensions currently under construction. The MTR train system works on a fare by distance system. Basically, the further you go, the more you pay. Payment is by using your Octopus card, single journey tickets, tourist day passes, and similar. The Airport Express has pre-paid return tickets. There are also fare concessions including certain discounts for doing the same trip more than once a day, including free return to the airport if you travel in the same day. This is particularly useful if you have a long layover between flights and want to get some fast tourist time in Hong Kong. The MTR system is a “beep in, beep out” system (except for the Airport Express), which means you been your Octopus card to enter your departure station, and you beep it again to exit, and your fare is calculated as a result. You can exchange freely from one line to another at the interchange stations without having to beep out. There is one exception station, which is the Tsim Sha Tsui and East Tsim Sha Tsui stations, where you have to beep out of one, and into the other. This is not generally recommended as it makes your journey more expensive. It is better to change at other stations. The MTR also operates a number of light rail / surface trams in the New Territories around the Tuen Mun and Tin Shui Wai areas. Riding these is considered a separate journey. The MTR subway and trains are such the common way to travel that many businesses will state their location relative to a station and even a particular exit. This is actually a key way to get where you are going in Hong Kong, and during your visit you will find the MTR a great way to not only get around, but to enjoy Hong Kong like a local! Planning a trip to a distant place is often a bit of a crap shoot, it’s hard to tell what the weather is going to be, and hard to know what to pack as a result. Thankfully, Hong Kong’s weather is mostly predictable and easy to plan for. The Hong Kong Weather Office has an app for Android and Iphone that will keep you constantly updated with live updates including warnings for incoming storms and such. First and foremost, Hong Kong is sub-tropical (so we have palm trees! ), and because of it’s position is generally very humid. Local weather forecasters consider any day under 60% humidity to be a dry day. As someone who comes from a very dry climate originally, I can assure you that Hong Kong is every bit as humid as they say, including some times where the humidity level nears 99% without raining. The factor of humidity has an effect both in the heat of summer and the coolest months of winter. The humidity is generally the lowest in the fall season, where the airflow is coming from Mainland China over land rather than from the sea. Hong Kong winter runs from about December to early March. During this time, the temperatures have a fairly wide range, going as low as 5-8C for the coldest days, and sometimes upwards to 24-26C on the warmer sunny days of winter. There is generally not that much rain during the winter months, although it does happen. The humidity is generally quite high, which makes the cold temperatures feel a bit colder, it sort of goes right through you. March and April are “spring”, where the temperatures are slowly increasing so that by the end of April, 30C is not out of the question. For reference, the outdoor swimming pools in Hong Kong generally open for the season during April or May 1st at the latest. The biggest difference over the time frame isn’t so much the high temperature, as much as the low temperature, which quickly moves up to the point where it’s never below 20-22C even at night. There is a bit more chance of rain during this period, but the temperatures are generally pretty enjoyable. Summer in Hong Kong comes in a couple of parts. First there is the early summer period in late April through June. This features plenty of nice high daytime temperatures, high humidty, and the continued increase of the nightly low temps. By the end of june, the low temperatures will be 26-28C at night, meaning that yes, Hong Kong is always hot. This is also the start of the rainy season, which continues all the way through summer into September. The second part of summer in July, August, and September includes the most sunny days as a percentage in the year, but is also peak time for typhoons and heavy storms. Temperatures are almost a rock steady 30-33C during the day, and 27-30C at night. Hong Kong typically gets a few Typhoon events per year, but they are generally short lived. The Hong Kong observatory has a system in place for warning about typhoons and other significant weather, so these storms will never be a surprise. When a Typhoon signal is raised (warning of an income storm) you will see signs in many places, including on TV and in shopping malls and such. Hong Kong however does not stop for these storms until they reach a high level. Hong Kong is a very safe place to ride out such a storm if it happens during your stay. The fall is by far the nicest time to come to Hong Kong, in my opinion. Late September and early October have a great combination of warm temperatures (still around 30C) and significantly lower humidity (under 70% often enough), and with the added bonus that many of the locals consider it fall and stay away from many of the attractions such as beaches and such. The temperatures often stay quite nice well into November, slowly dropping off as we transition back to the winter cycle. The average high temperature in November is till 25C, very comfortable for walking tours and seeing Hong Kong. With the local children in school and most everyone else back to work, it’s pretty much the best time to get access to the attractions and events around Hong Kong, and you will find the shortest lines during the weekdays at Hong Kong Disney as well. Overall, Hong Kong has no really bad seasons for weather. The humidity will certainly get your attention, especially during the summer months. The air quality in Hong Kong is often not the best, especially during the winter months. If you have asthma or other breathing related ailments, you may want to lean more towards summer and early fall for the best air quality and sunny days. Hong Kong is blessed with many types of public transit, from the ultra fast airport express train at one end to the traditional narrow trams of Hong Kong Island. Those Hong Kong trams are a real treat, and a remarkably good way to see Hong Kong for a really low price. The trams have run on Hong Kong island for a very long time, they were sort of the original public transit. The current system is one long line the runs from Kennedy Town in the west all the way to Shau Kei Wan to the East. Happy Valley (at the south side of the Happy Valley Horse Race Track) is the other general alternative. All of the trams run down pretty much the same line, going further or shorter depending on demand and the schedule. You have to look at the front of the tram to know which way each tram is going. Most of the Hong Kong Trams do not go from one end to the other. For the most part, they concentrate in the core of the system, running from either the Western Market or the Whitty Street Depot to Happy Valley, Causeway Bay, or North Point. That is good for touring the city, as they show up very frequently and really let you get around pretty quickly, especially for short trips. The best part is the fare, which is well under $3 for an adult. The fair can be paid in cash or paid with your trusty Octopus Card. Unlike most transit that is either pay first or beep in-beep out, the trams are a much more simple “pay as you leave” system. You enter the tram from the rear, and if you want to go upstairs you use the rear staircase to go up. Coming down you use the front staircase. The seats at the very front and very rear upstairs are some of the best seats for taking pictures and generally drinking in a more true view of Hong Kong as a city. Using the HK Tramways map, you can see that many of the most popular attractions in Hong Kong can be reached by tram. I personally enjoy riding the trams just because it gets you a chance to see what you might miss riding the MTR trains, all of the things in between the stops. I particularly recommend taking a late afternoon tram through to the North Point depot, as the last couple of minutes the tram goes through the middle of a very busy market, which often reaches right to the edges of the track. You can see a video of the North Point Tram ride here. The market itself is mostly a fish and fresh produce market on one side, and more clothes and such on the other. The tour to the top of Happy Valley is nice as well, the Happy Valley Race Course is perhaps one of the largest open green areas in downtown Hong Kong, with Horse racing at certain times of the year. The tram terminus point is at the end of the track and is slightly uphill from much of the rest of Hong Kong, giving you a great view. The Hong Kong trams are also good to ride after dark (remember, Hong Kong is a pretty safe place all considered, just don’t be silly!). You can check out the lights and activity and probably find yourself more interesting places to check out! I have many people ask me about getting around in Hong Kong and the amount of time required to get from one place to another. Knowing how many places you can go and how long it would take is sort of key when you are planning a vacation or a sightseeing day out. Before we get to that in a future post, I figure I should explain a little bit more about getting around in Hong Kong. It may come as a surprise to many, but public transit (buses, subways, trains, trams and the like) is pretty much the best way to get around in Hong Kong for many reasons. As I discussed in an earlier post, an Octopus card is a key part of your visit to Hong Kong. They are like a little wallet of money you can use in many places, and are a key part of riding the public transit systems in Hong Kong. If you intend to use public transit at all, it’s worth getting a card. They are not expensive to get ($150 HK to start out, which gets you $100HK credit plus some over run space), and they really open up Hong Kong. I can tell you that living here, I must use my card for non-transit related purchases probably dozens of times each week. It’s just that good. The key component of the public transit system in Hong Kong is the subways, trains, and light rail trains. Subways and trains are relatively interchangable, as many of the “subway” lines actually run outside, and trains like the blue line (which goes to the border at Shenzhen) have subway style stations but run on train like open rails. Except for cross border trains into China (which generally leave from Hung Hom Station) everything else is “public transit”, generally run by the MTR. Their stations are all identified with the same MTR logo, a very common sight in Hong Kong. To make it easy, I refer to them all as subways from now on, even though they may run outdoors. Taxis are pretty much universal in Hong Kong, in that almost everyone takes one from time to time, and in some cases, they seem to be about half the traffic on the streets (the other part being double decker buses!). They are also a fairly decent bargain for getting around town, especially if you understand a few things about how the systems work in Hong Kong. Hong Kong Taxis come in three flavors, Red, Green and Blue. The red Hong Kong taxis are the most common, they serve Hong Kong Island, Kowloon, and most everywhere else. There are a few tricks that come into play because of the difference between Kowloon and Hong Kong side, but we will get to that in a minute. The blue Hong Kong taxis serve Lantau Island exclusively. This is where you will find City Gate, Disneyland Hong Kong, the Big Buddah, and many other attractions. You can only get a blue Taxi generally if you are already on Lantau Island, and they will not normally leave the area either, except for airport runs. Unless you are heading to Lantau Island or taking a taxi from the airport, you might never see this rare Hong Kong Taxi. Green Hong Kong taxis cover the New Territories. That is everything north of Kowloon, including places such as Sha Tin, Tuen Mun, and so on. If you venture north, you are likely to see these green taxis. Again, they do not leave their area except for airport runs. The red Hong Kong taxis rule, and they go everywhere. While they generally won’t do short run trips on Lantau Island or in the New Territories, although they can. You will find them in both areas making trips to Hong Kong Island and Kowloon areas however. Please be aware that when you take a taxi through a toll bridge or tunnel, that toll will be added to your fare. Many red taxis will not venture outside of their areas, and if they do, they will be looking for a “return” fare. There are a number of locations (such as the Sheung Wan ferry terminal) where there are separate lines for taxis that will return to Kowloon side only, and there are a few areas in Kowloon and TST where you can find taxis ONLY going to Hong Kong island. While you can flag a taxi down on the street in Hong Kong, it’s recommended to look for taxi stands or parking lines, as you will usually find a taxi faster. You can also do the “swoop” as a taxi drops someone off, pretty much jumping in and off you go. Some drivers may not want to do that, but most are more than happy to get more business and stay active. Drop fees vary by area, but the red taxis drop fee is $20hk at this point, and includes some distance before it starts counting. Overall these are a very good deal if you are going point to point with 2-4 people, you can really cover a lot of ground! So, let’s say you have decided to take the airport express to your hotel. A good, safe choice, as the airport express will certainly get your closer to your hotel, and the free shuttle bus service is really helpful if your hotel is one of the ones on this list. If you haven’t don’t it already, now would be a good time to do the Things To Do Before Leaving Hong Kong Airport, because a bit of cash in hand is good, and the Octopus card will be used to pay for your Airport Express. Please note there are sometimes specials on the Airport Express (recent example was Hong Kong to the Aiport for $160 for two people… which is a bit lower than the price when you use the Octopus card). But remember, in the end, the airport express is $100HK per person from airport to Hong Kong (central) station, or under $13US… any discount would be about $2-$3 US is you can get it. It shows each station on the journey. The ones that are still colored are the ones remaining on this trip. Notice which way the stations are, because that is the direction that the train will travel when you get on – so you can sit on the train facing the right way! This system applies for all MTR subway trains in Hong Kong, so you can be sure you are heading the right way, and you know which way the train will run. When the train arrives, the doors will open and inside each door area is place for your baggage. Put your bags here, it really is safe, and just take your carry on with you. Take your seat and get comfortable, your journey to Hong Kong proper is about to start. There are three stations on the route, and you choose your exit based on where you are going. Most people will not get off at Tsing Ye (this is for the New Territories generally). For most travelers, it will be a question of Kowloon Side or Hong Kong side. If your hotel is on Hong Kong Island (such as Wan Chai, Central, Cuaseway Bay, North Point, Tin Hau, Happy Valley, or similar) then you will want to take the train to the Hong Kong stop. If your Hotel is in Kowloon, Jordan, Kowloon East, or similar, then you will want to get off at Kowloon station. One thing that happens on every trip is the issue of exchanging currency into the local money. Hong Kong uses the “Hong Kong Dollar”, often indicated as an example as $1000HK or $1000HKD. Thankfully, for the moment at least, the currency of Hong Kong is “pegged” to the US dollar with a pretty solid rate, 0.13 or 7.76 Hong Kong dollars for 1 US dollar. Because of this official peg, your exchange rate to Hong Kong dollars is essentially based on whatever your exchange rate may be to US dollars. For Americans travelling to Hong Kong, let’s just say it makes it very simple. There are tons of ways to exchange money in Hong Kong. First off, there are the exchange places at the airport. A recent survey showed them offering something near to 7 even, which is pretty poor rate. I never want to put down anyone’s business, but honestly, that exchange rate borders on criminal – 10% is a huge drop. The airport also has some currency exchange ATMs (Citibank, example) but I have never personally tried them, I don’t know what rate they give. The best bet generally is to use your ATM card to make withdrawals directly from your home bank account, providing you take a reasonable amount of money. Most machines will limit you to $2500HK per transaction, which should be around $320 or so US at a time. Add to that a transaction fee, and whatever the banks take in the conversion, and you are still okay. At the official rate you are looking at $322, and one recent transaction I did (against a debit mastercard) was $333, or about 3%. That makes for a pretty big difference. In town, there are currency exchange places just about everywhere, hanging out of every possibly nook and cranny and crevice in most areas. Keep an eye on both the rate and any fees they will charge you beyond the exchange, some have “no fees” beyond the displayed rates, while others will charge you for the service directly. Either way, check out what your net money would be and go with what works. If you get a street exchance over 7.5 these days you are doing pretty good. Some hotels also offer exchange services, but watch the rates, some of them are trying to profit from your ignorance about the exchange rates. More than anything, avoid anyone who is offering to do money exchange on the street or “down an alley” to a side office or location. While Hong Kong is generally not dangerous this way, there are always some who will try to rip you off. Stay with actual exchange shops and you will do fine. Finally, my basic rule for shopping. If you are any good at doing basic math in your head, when you are a hong kong store, just take the price you see and divide it by 7 to get the price in US dollars. You will give you a slightly inflated US price, but will also give you a pretty solid comparison after exchange and all that. In those terms, your Big Mac combo meal at McDonalds here costs under $4 US… nice! Before you leave Hong Kong airport for your hotel (or other final destination in town) there are a couple of things you should do. These two important steps will turn you into a real Hong Kong person and make your trip very much more interesting. Before you can do either of these things, you will need some cash. Hopefully you followed my advice and didn’t do any money exchange in the arrivals area of the airport, their rates are generally terrible. The best way to get cash in Hong Kong is to pull out your trust ATM / cash card and make a withdrawl. At current rates, a $1000HK dollar withdrawl is about $130 or so US dollars. Thankfully, there are a number of ATM machines right in the airport, which makes things a little easier. The cash machines are generally located in the area between the A and B exits, near the central elevator / escalator complex. If you came out of the A gate, that will be to your right down the concourse, and if you came out of B, it’s to the left. All of the stores and services are located along the wall between the A and B gate exits, so as you walk along from the A gate you will have shops and banks on your right, and restaurants on your left (congrats, you just saw your first Hong Kong McDonalds!). There are a couple of sets of ATM machines along the right side near the elevators. I think they are a Citibank and an HSBC, but not to worry, they have global access to most other banks. Withdrawing cash here will likely get you a much better rate than trying to exchange cash at the airport. You should probably withdraw a couple of thousand HK (which is only $250 US dollars) as you will need to spend a bit in the next few minutes to get yourself organized. Now, for Hong Kong step 1: You need an Octopus card. Why would you want an octopus on a card? Well, actually, in Hong Kong the Octopus card is possibly one of the single most useful things you can have. It’s you method for paying for trains, buses, subways, and even the airport express train. So in that regard, it’s sort of a transit pass. But it is much more, because pretty much every small convenience store (7-eleven, Circle K, Vingo, and others) will have a machine that lets you pay for your purchases by deducting right off the Octopus card. No more fighting for change! You will actually be very surprised all of the places you can use it instead of cash, from McDonalds and KFC to local restaurant chains like Fairwood or Cafe Coral. You can use it to access the cross harbor ferries, you can even use it in some places in Shenzhen in mainland China. It’s a value added storage device that will keep you from ending up with a pocket full of change, and also help you to not slow down lines in convenience stores! Okay, keeping up with my previous post about arriving at the Hong Kong Airport (terminal 1), let’s keep the show on the road and deal with the next part of your journey, getting from arrivals to your comfy, wonderful hotel (or the hole in the wall you have chosen, depending on your desires). The good news as you can see is that the aiport is absolutely filled with clear and distinct signs, and they are all bilingual English and Chinese, so no problems here for most people (if you are reading my blog, you are probably okay). The pictograms are also nice and clear and easy to follow. Hong Kong Airport is laid out in a pretty organized way, and the ground transportation is pretty much all in one area. As you come out of Gate A or B (see my previous Hong Kong Airport Arrival post for more in that part), the ground transportation options are generally right ahead of you. How you decide to do things will depend on your budget and size of group. If you are coming in with an organized tour group, generally your tour leader should meet you right here in front of the gates, and you don’t have to go any further. Keep your eyes open for the person holding the right sign for your group, and you are on your way. The same thing with most pre-arranged travel by limo or shuttle bus. If their service includes meet and greet, they will do it right about here, and they will guide you from that point. If you are like the rest of us and having to figure your way from the airport to the hotel yourself, then it’s time to examine your choices on how to get where you are going. It’s also time get yourself some Hong Kong supplies so that the rest of your trip goes well. The Hong Kong Dollar is (for now) pegged to the US dollar. The exchange rate is 7.75 HKD for 1 USD. The exchange rate with other currencies (for the most part) is relative to the Hong Kong Dollar exchange peg with the US dollar.